Fodder Chopping Machinecheck them on time – treatment facilities should be equal for all.” Indeed, frontline health workers can identify the underlying causes of poor health, and refer children and families to existing social support programs. They can educate patients and families about work related harm and what can be done to make children safer. They can also raise awareness among local community leaders and advocate for social change so that children do not need to work, or at the very least, so that harm reduction strategies can be implemented. 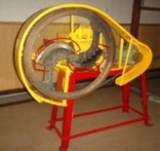 For instance, a redesigned fodder chopping machine developed by the Centre for the Improvement of Working Conditions and the Environment (www.ciwce.org.pk) protects users from the sharp blades to prevent similar injuries in future. This is just one example of many. Moreover, we intend to build on local knowledge and experience to develop more universal principles and guidance for assisting frontline health workers in providing direct care to vulnerable children and families and in stimulating larger social change. The first phase of our work involved conducting interviews with a wide range of child labourers ranging from agricultural workers and rag pickers to street vendors and domestic workers. These children reported numerous harms related to their work, going beyond physical injuries, to include financial exploitation, psychological trauma, discrimination and sexual abuse, not to mention having to abandon their studies and jeopardizing their chances of obtaining an education and improving their prospects for the future. Interviews with various health workers and community stakeholders revealed particular concern regarding children who get caught up in illicit activities such as working in the drug trade (particularly in Brazil) or who are sexually exploited as child prostitutes. In Niger, children are even involved in mining for gold and risk falling over 70 feet to their death in an open pit (see video clip Child Labour in Niger below). Yet, even in the face of widespread poverty, where in some countries more than 50% of children work to support their families, frontline health workers can make a difference.